Could Rocket League have a rival? 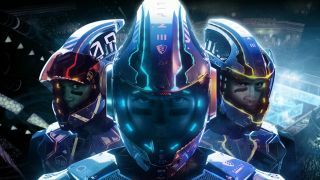 Find out for yourself with Laser League's weekend "field test"
You probably haven't heard of Laser League yet, but imagine Tron and Rocket League had a baby. It's got sweet neon looks and competitive gameplay, and you can try it out early with the game's closed beta test on PC this weekend. You'll need to sign up at the official site of course, and then you'll get access to the "light-speed multiplayer arcade sport of 2150." If nothing else it's nice to imagine nuclear war or climate change won't have killed us all by then. The game is based around two teams battling to take control of different nodes, and using deadly light beams to their advantage. It has all the ingredients that give good multiplayer, 16 different power ups, six classes so you can find one to suit your play style, and a thumping arcade heart in its brightly lit chest. It's the work of developer Roll 7, the team behind finger-skating BAFTA winner OlliOlli, so these guys know how to make an addictive game. The beta will be open this weekend until October 29. The full game is due for release on PlayStation 4, Windows, and Xbox One in 2018.